Dolezal’s refusal to stage sequences required him to have complete access to her life on the road, and the footage he captured of her final successful tour in 1999 serves as the movie’s framing device. She gave so much of herself in performance after performance that there was no hope of it being sustainable. The co-dependent relationship she forged with Brown was ridden with abuse and manipulation. It’s fitting that the couple met at the Soul Train awards where she was booed allegedly for “not being black enough,” a lacerating rejection that remained with her until her death at age 48. Brown’s jealousy propelled him to play on his wife’s low self-esteem, dragging her down to his level by making her feel unworthy of acclaim. Divorce was not an option for the devoutly religious Houston, causing her to stay with him long after she should have left. The fear of a judgmental God may have also been the reason why Houston gravitated away from Crawford, her longtime friend whom she may have been romantically involved with—the very notion of which still causes her mother, Cissy, to bristle. The film suggests that Houston may have been bisexual, and though Brown fought Crawford for his wife’s affections, he later confesses that had she remained by her side, his wife may still be alive. “Bobby Brown is not the reason she is dead,” Dolezal flatly told the audience, articulating what is already well-documented in his film. To paraphrase the words of Houston’s former bodyguard, there is plenty of blame to go around. Of all the talking heads in Broomfield and Dolezal’s documentary, bodyguard David Roberts may be the most persuasive, not to mention the funniest. He quips that “The Bodyguard,” the 1992 hit film swiftly upstaged by its own soundtrack, was essentially the story of his relationship with Houston, albeit with two major exceptions: he never fired his gun and he never slept with her. It was Kevin Costner, of all people, who insisted that the music be taken out from the opening of “I Will Always Love You,” enabling Houston’s voice to be featured entirely on its own. There’s a wonderful moment at the very beginning of the film where Houston pauses before she belts out the song’s immortal line at a concert, drawing out the silence in order to bask in the crowd’s anticipation. Her strength onstage was so overpowering that it comes as a shock to learn just how vulnerable she was behind the scenes. Her drug use began long before she met Brown, and when Roberts attempts to sound the warning bell, filing a report on her drug intake, he is promptly fired. Like many people in the industry, Houston was surrounded by enablers while lacking a stable parental figure. Cissy couldn’t bare to see her daughter have the success she never achieved in her own career, and later accused Whitney of “stealing her style” in her memoir. Equally upsetting is the lawsuit filed by the singer’s beloved father during his final days, one of many reasons why people close to Houston claim that her death was caused primarily by “a broken heart.” It’s practically impossible not to get choked up while watching footage of Houston dancing onstage with her young daughter, Bobbi Kristina, whose life would ultimately follow the pattern of her mother, ending in her own untimely demise. Though there are plentiful joyous performance sequences to savor, I found the film to be deeply sorrowful, reminding us of all that was lost when a great voice was forever silenced. Today’s headlines so often seem to have been spawned from yesterday’s cautionary science-fiction. Steven Spielberg’s 2002 hit, “Minority Report,” was much more than an escapist thrill ride. It was a prophetic look into the technology of our modern world, as evidenced by two documentaries screening at Hot Docs this year. Matthias Heeder and Monika Hielscher’s superb “Pre-Crime” illustrates how data collection is being used to police people, a method fraught with as many glitches as the Precogs’ visions of future perpetrators in Spielberg’s film (a fact accentuated by the line, “Code doesn’t have a conscience”). It’s difficult to say just how dependable these algorithms are in determining the crimes a person will commit, not to mention the products they may purchase. I couldn’t watch Scott Harper’s “You’re Soaking in It” without instantly being reminded of the scene in “Minority Report” where an advertisement scans Tom Cruise’s retinas and addresses him by name as he walks past it. This sort of corporate invasiveness may have looked far-fetched 15 years ago, but it has now become commonplace online. In a span of 75 relentlessly info-packed minutes, Harper explains how the “freedom” of the internet comes at a major price, enabling advertisers to utilize our e-mail correspondence and social media posts to create a comprehensive picture of our identities as consumers. We are all essentially naked in the eyes of our glowing rectangular counterparts, always at our side, always watching. It was only a month ago that Congress voted to allow Internet Service Providers to sell the sensitive information of consumers to advertisers without their consent, thus increasing the urgency of Harper’s film tenfold. There’s a telling moment when Keith Reinhard, chairman emeritus of DDB Worldwide, cites the wisdom of his agency’s co-founder, Bill Bernbach, who he dubs “the Picasso of the ad world.” Bernbach believed that the most persuasive advertising appealed not to the intellect but to the emotions, and the same could certainly be said of Donald Trump’s successful presidential campaign. Ethan Zuckerman pops up to apologize for creating the pop-up ad, while Gabriel Cubbage recommends that viewers prevent the intrusions of advertisers with his AdBlock app, which has been endorsed by Edward Snowden as a prime method of evading Big Brother’s prying gaze. Whereas ad agencies could rely on a majority of the American public viewing their commercials in the early days of television, the rise of the internet has fractured consumers’ attention so dramatically that the Mad Men of Madison Avenue have gradually been replaced by the Math Men of Silicon Valley. We see slow-motion footage of analytically minded twentysomethings engaging in what appears to be Live Action Role Playing, I suppose in order to serve as a nerdy contrast to Don Draper. Deserving extra kudos is the elementary school teacher who guides his students in understanding the sinister effect of advertisements masquerading as harmless programs, such as LEGO’s “The Build Zone” videos. 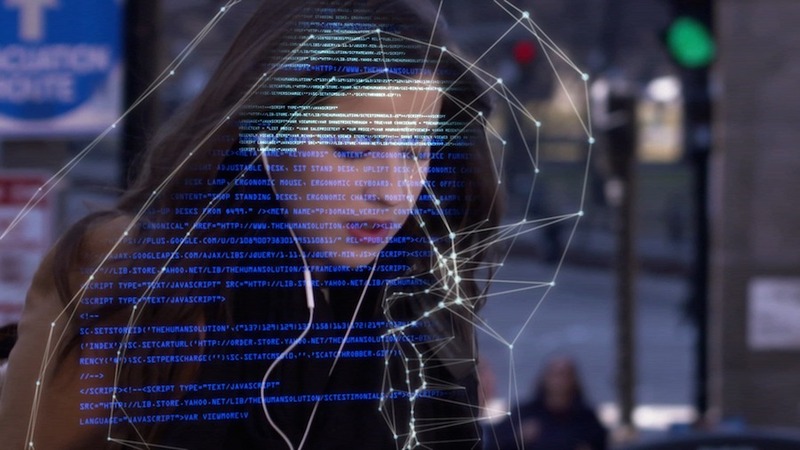 Perhaps most troubling of all is the film’s suggestion that world-shaking events could occur if data gathering is manipulated by rogue forces in order to influence institutions. Considering the Russian Twitter bots and foreign-made fake news that allegedly played a crucial role in electing Trump, this theory may have already come true. The story that Wester recounts is so compelling that it’s easy to take his masterful technique for granted. 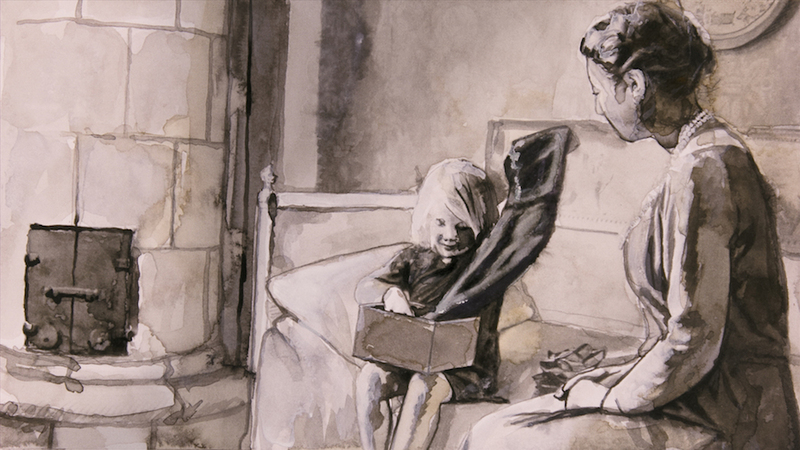 These memories from his grandmother’s grueling childhood so transfixed the director that he decided to recreate them in numerous watercolors. There are just enough frames of movement to make the imagery seem alive, and once the viewer falls into the film’s rhythm, Wester’s fusion of paintings and archival footage proves to be seamless and immersive. This may in fact be a more accurate representation of memory than the typical staged recreations, since each drawing is the sort of remembered moment forever seared into Hervor’s mind. As an artist, Wester has a great gift for human expression, bringing out the sadness in smiling eyes. The sound design is also tremendously effective, subverting the tone of various moments at the drop of a hat, as a pleasurable train ride with Ada literally comes to a screeching halt. Even more jarring is the sickening crunch of a shoe slammed against the ice, as Ada attempts to drown her and Hervor in a fit of profound hopelessness. No wonder that Hervor, who we see in fleeting home video footage, spent the entirety of her adult life fighting for women’s rights, serving for 30 years on the Social Welfare Board. These inspirational sections of her life would’ve likely been covered in a feature-length version of this picture, which clocks in just under an hour. Yet there’s something perfect about the film’s length, since it encompasses the poetic impressions of Wester, who brilliantly links Hervor’s memories of her birth to a dream she had of falling through the ice. In both cases, she found herself shrouded in darkness before a voice called her toward the light. No phone call in recent cinematic memory has shaken me to the core quite like the one made by Viyan, a woman kidnapped by ISIS, to her family. They are among the thousands of Yezidis who were displaced from their town of Shingal, where their ancestors had lived for centuries, after ISIS attacked it. Viyan’s family has found temporary refuge on the Turkish border as they huddle around a phone, listening to her voice as she articulates what is nothing less than a vision of hell, one that an estimated 3,000 women are currently experiencing at the hands of ISIS. She speaks of women being taken from their husbands and told that they will be freed if they marry an ISIS member. She mentions how children are being brainwashed into killing their own parents, while ISIS will routinely beat women who refuse to pray five times a day. As the U.S. continues to bomb nearby areas, Viyan yearns for the bombs to be dropped on her so that she could either die or be rescued from her captors. “They have no religion, they are beasts,” she replies. This is one of many unforgettable scenes in Angelos Rallis’ “Shingal, Where Are You?”, one of year’s most devastating and essential films. It premiered last November at the IDFA, and should be considered required viewing for every American citizen. “Obama doesn’t know that other minorities exist in Iraq,” says one elderly Yezidi man, claiming that the president mistakes them for Kurds. He feels that his community’s entire way of life is being wiped off the planet, and that is precisely the intention of ISIS. So deeply insecure are the Islamic State's followers that they cannot allow the world to have beliefs different from their own. They are also incapable of courting women without holding them at knifepoint, but they are scared away when the women turn the knives on themselves, asserting that they would rather die than marry one of them. The lack of music in the film is appropriate, since there is no levity provided for the Yezidis’ alienation. Yet I could swear I heard traces of a mournful choir amidst the wind as Havind, Viyan’s father, walks with his son through the bombed-out remains of Shingal. The boy returns to his house, digging out a plant from a pile of rubble on the bed and placing it on the floor. He then takes a framed baby picture off the wall and cradles it like a newborn before smashing it to pieces in order to complete the damage. Rallis’ film is agonizingly powerful without ever going for a contrived effect. The camera hovers like a ghost floating amongst the characters, who occasionally acknowledge its presence as a good luck charm as they attempt to negotiate the return of their loved one through various intermediaries. On the periphery of the narrative is a group of boys who try roughing it on their own outside the refugee camp, empowered by their ability to cook fish while hoping to find a new home in the near future (“Americans take refugees on their own expenses,” one kid observes, the hope in his voice utterly heartbreaking). A title card informs us that 500,000 Yezidis have been displaced, and that thousands of their bodies have been discovered in mass graves after their towns were reclaimed from ISIS. The film concludes with a much different phone call, as Havind speaks with a member of his family as she heads to make a new life for herself in Europe. Though there has been a great deal of crying in the movie, Havind has maintained his composure, even when he sings about the unspeakable atrocities ISIS has committed. Yet as he speaks to his child while surrounded by the wreckage that was once his home, the weight of his despair seeps through his every movement and utterance. After Havind hangs up, we share in his prolonged silence as he sits, collecting his thoughts before getting up and walking out of frame.